ï»¿ Jayfeather & Yellowfang & StarClan - Your Opinions? I am here to discuss about... Jayfeather (and Yellowfang), who (both) obviously deserves the "Awesome Award". 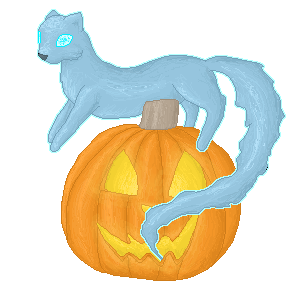 My thoughts on Jayfeather: Jayfeather was probably the most interesting character in the Warrior Cats series. He had this grumpy attitude that made you want to kill the crap out of him but love him at the same time. He was blind and he struggled with this fact for quite some time. Jayfeather had a fighting spirit and it was probably contained quite a bit when he became Leafpool's apprentice. It greatly frustrated Jayfeather throughout his life and he most likely took his frustration out on everyone. It obviously didn't help he was one of the 3. All Jayfeather wanted was a normal life but of course, he could never have that. My thoughts on Yellowfang: She had a very rough life. It really didn't help that StarClan gave her the ability to feel other cats' pains. Like Jayfeather, she had a fighting spirit and had a strong desire to be a warrior. But that wasn't her destiny. She was suppose to be the medicine cat. And destiny was using her as ShadowClan's punishment for banishing SkyClan. Of course, as an apprentice training as a warrior, she had to fall in love with Raggedpaw. Then as a medicine cat apprentice, she couldn't put him behind her, as a cat of an old life. No, she had to have kits with him and of course, only one survived, that one was given to the most spiteful queen ever and that kit grew up as the most terrifying warrior ever! Then of course she was kicked out of the clans by her OWN son! Then at the end of the first arc, she had to poison her son. Really! Yellowfang had a hard life! And of course we can all blame it on STARCLAN!!!! If she hadn't had her ability of feeling other cats' pains, she wouldn't have become a medicine cat. And if she hadn't become a medicine cat, her son would have been able to grow up with a loving mother. And if he had grown up with a loving mother, he wouldn't have become the terror, Brokenstar. So does anybody have any thoughts/opinions about Jayfeather, Yellowfang, and HOW STUPID STARCLAN IS? Sorry... me and StarClan... we're not on friendly terms. Re: Jayfeather & Yellowfang & StarClan - Your Opinions? correction - Brokenstar was not killed at the end of the arc, but halfway. He died in Forest of Secrets. To me, both Jayfeather and Yellowfang are interesting characters, and I agree that they both have their own strengths and weaknesses. I seem to remember him being bratty to Brightheart, which she did not deserve at all. Yellowfang in my opinion had it a lot worse off. She got into a bad situation and she knew it, and tried to do what was best for her son but then he turned out evil. I felt really really bad for Yellowfang when she gave Brokentail the deathberries. That was a really hard choice but she made it. Honestly though, I feel when she had him she should have resigned as medicine cat to try and raise him herself. I haven't read her super edition so I'm not sure if that would have been feasible or not. They kinda of make a ton of weird decisions. I also feel they have less control over everything than we sometimes think they do (which I honestly chalk up to Starclan not being...super well written sometimes). I loved Yellowfang until she just excused Ashfur as if he was a baby. Jayfeather, I though he was a bit too grumpy and bratty at some points, but I dont hate him. Now StarClan, I hate them. It's like when a cat dies they become completely OOC. Silverstream not being spoiled is the only thing I like about it. Also, the fact that they dont allow Clawface or Hawkfrost in but Ashfur is completely okay. Yeesh I totally forgot that Yellowfang did that, that's upsetting. This is what happens when you haven't read the first arc in a bit: All the events that take place get tossed around. The cost for admitting she broke the Medicine Cat Code means Yellowfang would have been humiliated or even banished from ShadowClan. At this point Raggedstar was only the deputy. There are probably tons more reasons but I can't really recall them all. I HAVE NO RESPECT FOR STARCLAN. Ever since they started trying to include them more in the books, my wonder and respect went down. You just can't do that to your 'gods' so to speak... it humanizes them and makes them no normal than the regular living cats. They're just dead and they sparkle. And sometimes tell you something awful is going to happen. I think they could have been written a lot better, and I'm upset that they were reduced to... well, mewling kittens. Do you think this would have happened only because she was in Shadowclan? I mean Leafpool ended up mostly ok and her kits were even worse because they were half clan (though you could argue Thunderclan is more lenient) :X Honestly the rule that medicine cats can't take mates is pretty silly imo. I personally never saw them as "gods" or anything similar but I do agree, Starclan just doesn't seem as...interesting or as powerful as when the books first began. I think it really depends on the leader. Leafpool was Firestar's daughter. :X Honestly the rule that medicine cats can't take mates is pretty silly imo. Not really. There was a fairly reasonable reason for it. Some medicine cats may have been more biased towards their family and might treat them before other cats who have a far more need for the medicine cat's attention. Oh no I didn't mean that they should take mates and stay medicine cats, but I think they should have the right to change their mind and not be judged. If a medicine cat comes to a point in their life where they want to be a parent, then imo, they should be allowed to step down as med cat and be a parent. If they become a parent on accident well, deal with your mistakes, lying to your kits and your clan is hardly fair. But life isn't particularly fair. The clans aren't particularly fair. The cat's IN the clans aren't particularly fair. Not all of them anyways. I don't mean to say the clan's have no right to have such a high expectations of the loyalties of their clanmates, but sometimes, their value of loyalty can get a bit extreme. My issue with StarClan is that they can never stay consistent. It doesn't matter what arc, what super edition, what book... nothing is the same. Especially with a lot of the elder, wiser cats (Yellowfang, Bluestar, Whitestorm, Lionheart, ect) in StarClan. While these cats were alive, we didn't see anywhere near as much of these popups from the Dead Starry Cats. The prophecies from Power of Three and Omen of the Stars were literally spelled out, and made obvious as hell to the reader, especially the ones from climax of the fourth arc. It was made glaringly obvious that Firestar would play a huge part in Omen of the Stars, and that kind of annoyed... especially because it basically tossed the Three back onto the sidelines, while Firestar did all the work, battling with Tigerstar. Dovewing used her powers...maybe a small handful of times for something useful, and the rest was just nonsense. Hell, Firestar being the fourth was utter nonsense too- Ivypool did much more than he did, and she just got cast aside in favor of her sister. A horrible thing with StarClan and most of the writing.. is that they treat the cats like they're days-old kittens- so many of these prophecies could be much more mysterious and vague if they'd stop making it obvious which cats they want involved.